This is the time when we resolve to do things differently. I’ve certainly resolved to do a number of things differently, but most of these are neither here nor there to most of you, and probably little different from your own resolutions about Bible-reading and body fat and general niceness towards one’s fellow man, no matter how nasty he may be in return. 10. Owen Wilson Romantic Comedies. Like many popular actors — Seth Rogen, Vince Vaughn, Adam Sandler, Tim McGraw, Michael Cera, and his own brother, Luke — Owen Wilson has less range than a Pixar character. At least when you watch Vince Vaughn playing precisely the same character in movie after movie, you can take solace in the fact that he is amusing by nature. The mash-nosed Wilson is, by contrast, dull as dry toast. Watching him woo a girl is like watching a hobo tap dance. He seems happy enough doing it, but you doubt he’s a professional, and you’re puzzled why you paid good money to witness the spectacle. 9. “Epic Fail.” The first word should only be applied to literature penned before 1869. The second should be reintroduced to public schools, and applied mercilessly until schoolchildren tremble at its utterance. 8. One. Word. Sentences. Yes, I know I do that sometimes. But I also pick my nose sometimes. 7. 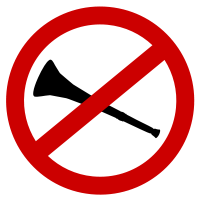 Vuvuzelas. It’s not the noise that’s troubling, it’s that the name just sounds so dirty. 6. Snooki, The Situation, and Every Other Jersey Half-Wit. I realize that last part may be redundant. 5. Justin Bieber’s Voice. I blame his parents, for letting him get made up and prance about like a little girl. Any princess is bound to be heartbroken when her testicles finally drop. 4. Popped collars. They just lead to parachute pants, Swatches, and glam bands. I thought all this went by the wayside when Nicolas Cage punched out Michael Bowen in the penultimate scene of Valley Girl. Clearly I was mistaken. 3. Pretty vampires. The Twilight imitations alone now litter the shelves in the juvenile fiction section of big box bookstores. One day we’re going to get invaded by rabid vampires from some crypt far beneath the earth’s surface, and all you collaborators are going to be singing a different tune. I, on the other hand, have a working chop saw, live on twenty acres littered with hardwood trees, and stand prepared to put a merciless, bloody end to any vampire, no matter how sensitive he looks. When the vampire stuff hits the fan, rendezvous at my place. 1. Zombie celebrities. I’m not talking about AMC’s new series. I’m talking about celebreality shows in which Leif Garrett tries to get sober, or Bret Michaels pretends he doesn’t have a receding hairline, or Ozzy Osbourne tries to formulate a sentence. At least in actual zombie movies, there’s a protagonist with a shotgun to put these drooling parasites out of our misery. In reality they just keep multiplying, and taking up perfectly good TV space that George Foreman could be using to sell his very handy and affordable mini-grills. I recognize there are many more pop icon candidates for disposal. Feel free to share some of your own, and have a lovely start to what I hope is a peace-filled new year for all of us. I’m shocked that you didn’t include the Black Eyed Peas on that list. I quit watching TV a little over two years ago, and our family doesn’t get a daily newspaper. Sometimes I worry that I’m becoming one of those culturally illiterate people that I once sneered at for not knowing who the American Idol contestants were or what happened on the latest episode of “Lost.” And then I read your list, had to google a couple of the items you mention because I know nothing about them, and realize I have nothing to worry about–I’m missing nothing. Thanks :)! “Om nom nom,” “Oh hai,” “kthxbye:” They’re no longer as funny as they were, and they were never really all that funny. They’re signifiers of hip cuteness that don’t work on either of those levels. They just make you sound like a casualty. The Black-Eyed Peas are so 2009. Annette, I’m glad to know I’m not the only person who’s forsaken the paper. “Signifiers of hip cuteness.” I dig that. Totally going to steal it.